“the road less travelled” – my favourite poem and my favourite place …. NB: This week I am following a “blogging101″ online course to learn how to blog more effectively. Please bear with me while I do my daily assignments, I obviously don’t usually write daily posts and if you are fed up with them – don’t read them – smile! On the other hand, you might like to comment and let me know how I’m doing! This is actually not the assignment for today, it was to try changing the blog title and subtitle, and I have tinkered around with the subtitle, to try and give a better idea of what this blog is about – but I’m still not sure I’ve got it right – so comments/feedback would be appreciated! I should be showing a picture of a track in the forest here, but I don’t have one to fit – instead, this is one of my all time favourite places – at the southern end of the Brecon Beacons, and I want to tell you about a drive I took yesterday…. The road is just at the bottom edge of this picture, you park your car then take to the hills, crossing a river and follow a path that runs besides a tributary stream, full of small waterfalls. (This is said to be the start of the River Tawe, that runs into Swansea and then into the sea.) Just under the ridge, that’s covered in snow in this picture, there is a lake. Its stunning! I’ve taken my swimming costume up there in summers past, and swum in it, with my dog! The best thing about this place, is that its less than10 miles away from the rather forlorn ex-mining valley which I showed you pictures of yesterday – if you read all the way to the end of “Welcome to 2015“. So when I’m in the mood for solitude and contemplation It takes me about 15 minutes to get there. Yesterday wasn’t a day for walking – it was dull, misty and cloudy, and I had parcels to post for customers. I mostly go to my local post office, but I was a bit miffed with him because when I went in on Friday, with a heddle (part of a weaving loom) to post to Italy, I had assumed it would cost me £5.75 to post, but he insisted that because it was a centimetre of two over 60 cm, it would have to go by the more expensive ParcelForce, and I was just about to say OK, when he told me the price – £27 something. I’d had quite a chat thro’ the etsy site with the guy in Italy, and even reduced the price for him a bit because he didn’t have quite enough in his paypal account – so £27 was the price he paid for the heddle, and there was no way I wanted to disappoint him, but I wasn’t paying £27 for postage! The price quoted was for a parcel and I pointed out that it could go as a tube, which WAS £5.75, because its thin and not very wide, but the post office guy objected to that because it wasn’t in a proper tube! Well, we went back and forth about it, and I had to fetch the leaflet for him to check the allowed dimensions for a tube, which this item did fit! And insisted it went as a tube. He hummed and hah-ed over this – the queue behind were getting restless – and in the end he relented, but made a very heavy point of telling me it was at my own risk. Actually, I am taking a risk, because the package might be rejected in the UK, by my favourite gripe, the Royal Mail ( see my previous posts about them), or by customs in Italy, which Riccardo told me was the same as the rest of Italy at the moment – nothing works! That done, I went home and looked to see if I could have posted it through an alternative carrier, and the cheapest was about £15, and was only located in London – all the rest were not far off the £27 mark. I also deleted the international postage options from the listing, at least until Riccardo tells me he’s got the parcel, and had to tell him that it may not arrive, in which case I will not only lose the £5.75 postage, but the cost of the heddle as well, because the Post Office won’t compensate me if it gets “lost”, as it probably doesn’t really qualify as a tube, and it certainly won’t if I made a claim! Time for another photo – which one shall I choose – I’ve taken loads of this place, and got this one printed up as a poster. Actually, I have to admit, the whole drive was a digression – I just fancied a change, but I hadn’t realised it until I started on the road …. and for some reason, again totally spontaneously, I passed by my usual parking spot, and carried up to the sheep grid (there are loads of sheep on this road), past the alpaca farm that has sacks of alpaca manure in the gateway for people to pick up and put 50p in the box (thinks, I must stop by there one day and actually ask if they sell their fleeces), and past the road I had intended to turn round at, to the edge of the forestry’s fir plantation, where there is a little track that I have stopped by many times, with my lovely sheepdog Sol – now no longer with us. I have a secret … that I don’t tell many people, but it doesn’t matter now …. so I can tell you – smile. Sol was also originally from a farm, (like Tilly, the kitten in yesterday’s blog). They didn’t want to keep him and train him as a working dog, because he was a cross – I can never remember the name of the breed, but it was an Australian sheepdog, bred to have amazing stamina and energy, and to run for miles and miles. And Sol had surely inherited that trait. 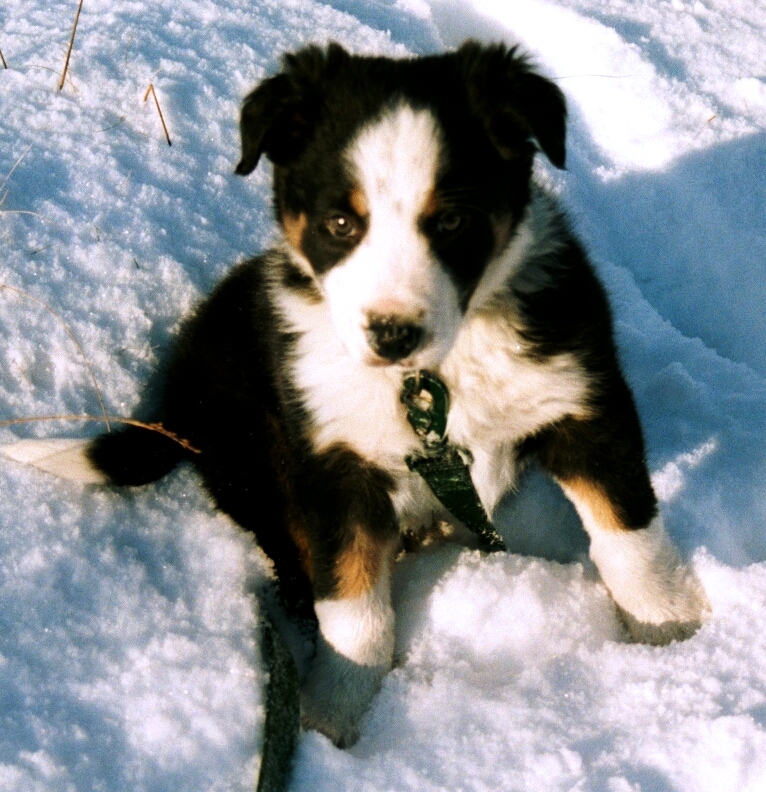 this is Sol as a puppy, also, coincidentally, in the snow on the Trecastle Road. He had so much energy that I could never exhaust him, and when I took him for walks in the hills, I had to be really careful he didn’t get a chance to chase any sheep. So what I used to do, was to take him to the point where this little road branches off, let him out of the car, and he’d run beside the car for a mile or so first, which just about got him tired enough not to pull on the lead so much that he got loose. For some reason I never actually drove down this road, but on the slightly larger main route. There was seldom much traffic on it, and what there was were farm vehicles, who weren’t bothered by this, and occasionally some tourist traffic that probably were a bit amazed by us, but never stopped to tell us off, and probably told the story of the eccentric Welsh to their friends when they got back home. I think I was propelled by my memories of Sol to go there yesterday, it was a small homage to him. I miss him still. The car just turned into the smaller road, I don’t know how – and I thought – well, its about time I found out why there was a road here – and carried on, fully expecting it to peter out into a track thro the forest, with a gate restricting access. “The road less travelled” turned into miles of beautiful scenery, that I’d never encountered before. I was on the other side of the mountain, and it was cathartic! It felt like a symbol of a new start, taking a chance on 2015 and finding a new place to be. Yes, I know it sounds a bit batty, and spiritual, but that’s what is was, I felt totally uplifted – and a bit worried that I wouldn’t find a way back home, as the road kept going on and on! Actually, it turned back on itself and finally led me to Trecastle, and back onto the main road, and the small post office, and then back home. And no pictures, cos I didn’t have my camera with me! Sorry for going on and on but I just had to tell someone – smile. And its my birthday today – and no – I’m not telling you how old I am, you’ve had all the secrets I’m giving out today – smile. I KNOW – I hadn’t CLIMBED THE MOUNTAIN – I’d gone around it. But it doesn’t matter – I saw the other side! It is a rhetorical question. Just my way of acknowledging your loss. good to know some local people have found the blog and thanks for the comment – certainly enjoyed your blog – I had to look up the poem to make sure I got the lines right – and then purposely misquoted it cos I think most people would know where it came from anyway! Thanks for dropping by my blog – glad you like it! 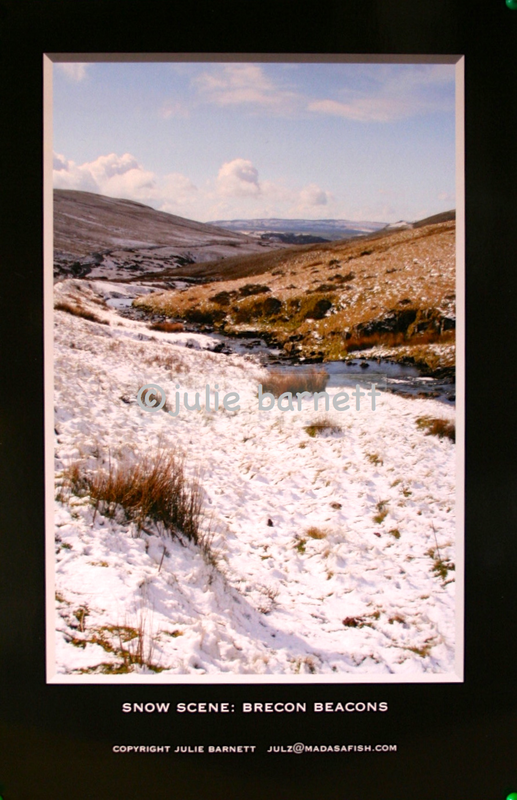 And thanks also for the Robert Frost lines (one of my favourite too) and for the pics of the Brecon Beacons – coming as I do from Powys, it’s a refreshing sight!